The opportunity to see history being made on the movie screen comes but once or twice a generation, and right here, right now, one of those rare events is happening with Peter Jackson's adaptation of the "Lord of the Rings" trilogy. Last winter saw the audience on its first rich excursion into Tolkien's Middle-Earth with "The Fellowship of the Ring," and now comes "The Two Towers," the second film in the series, which picks up exactly where its predecessor left off, diving headfirst into the material as if not a moment has gone by since we were last stranded in the realm of wizards, mortals, elves, dwarfs and hobbits. Much has happened since the adventure was halted 12 months ago—the first endeavor received 13 Academy Award nominations, grossed over half a billion dollars, and was even recently released as an extended cut on DVD—and yet the initial experience remains fresh in the mind, enduring even when other ambitious projects in that time frame have been completely forgotten (the latest "Star Wars," anyone?). Being more of a visionary than a filmmaker, though, Jackson knew his task in "Fellowship" wasn't nearly as much about adapting a complex story as much as it was about sculpting plausible exteriors. 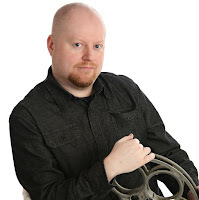 A year later, his fundamental mission finds itself being inverted; imagery and atmosphere are already established, but the narrative is caged at the direct center of a wide-scale conflict, lacking a true beginning and ending and challenging several of the essential laws of cinematic storytelling in the process. He probably saw the questions long before the writers ever did: where does the journey resume? Does it reference the past? Where does it stop before abandoning the viewer for yet another year? Since this is the bridge between an introduction and a conclusion, Jackson realizes that "The Two Towers" is probably the most important film of the series. But do not doubt for a moment that he will be unable to dodge those obstacles; this is, after all, the same man who made the best film of 2001. Surging from the vibrant heels of the first "Rings" chronicle, "The Two Towers" takes the tradition of Tolkien's work into a darker, creepier and more seriously woven direction, magnifying the scope to something that the first feature barely scratched the surface of. But it isn't a film about continuing where other things left off, mind you; instead, it's a strong and surprisingly self-reliant piece, referencing its predecessor in occasional dialogue exchanges without dwelling on it very long before we're thrown right back into the fray. At the core, naturally, it is crucial for the picture to carry the support of "Fellowship" over into the final chapter of the saga, but don't assume that the endeavor requires you to know every detail of what went on beforehand, either. The movie not only compliments an evolving package, it is a triumph as an independent work as well. Gone, furthermore, are the lush green hills of Hobbiton and the intricate establishments of Rivendell; in place of those colorful locations are the most swarthy, moody and menacing little corners seen thus far in Middle-Earth, steeped so greatly in the looming onslaught of evil that they nearly choke the players of their basic sense of sanity. At the opening of the film, Frodo Baggins (Elijah Wood) and Samwise Gamgee (Sean Astin) are fearfully slogging their way though the peaks and marshes just east of the land of Mordor, vaguely recollection on all the adventures that severed the fellowship, resulted in the death of a comrade, and eventually forced them to abandon protection and seek out Mordor alone. Their journey, however, becomes further plagued by weariness and dread when Gollum, the withered former host of the one ring, appears out of nowhere and literally foists his way into the hobbits' dangerous travels. Gollum shows allegiance to the ring and its master, vowing to safely guide the current ring-bearers closer towards Mordor, but behind the fearful and crippled facade, he is a troubled being at war with himself, fighting off a brewing dark side even when the light one seems to be fading. 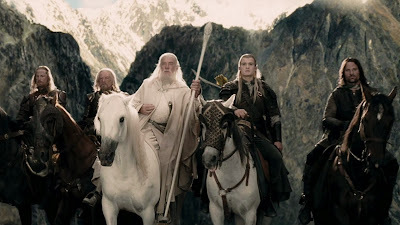 While their journey progresses ever so carefully towards the gates of Middle-Earth's heart of evil, the remaining members of the fellowship—Aragorn (Viggo Mortensen), Legolas (Orlando Bloom) and Gimli (John Rhys-Davies)—pick up on the trail of the other hobbits, Merry Brandybuck (Dominic Monaghan) and Peregrin Took (Billy Boyd), who were captured at the end of "Fellowship" by a wave of orcs and are being taken back towards Isengard, the site of the rising Uruk-hai army and its master Saruman the White (Christopher Lee). What Aragorn and his partners don't realize, at least at first, is that the missing hobbits were able to successfully flee from their captors on the outskirts of Fenghorn Forest, and they are now being protected by the gigantic and wise Treebeard, the oldest living being in Middle-Earth who guards over the woods like a guardian to all of nature. The title "The Two Towers" refers to the alliance made between the fortresses of Isengard and Mordor, the two root sites of evil in Middle-Earth that strive for the same goal: to completely eradicate the race of men so that the pursuit of the ring is tipped greatly in favor of the dark lord Sauron. The dramatic urgency of this conflict, needless to say, forces the hobbits and their quests to be played down a bit in order to make mortal men the central focus of the plot, and as a result, we spend a good portion of the three-hour running time observing Aragorn, Legolas and Gimli in their attempt to unite the fragmented kingdom of Rohan to stand against the armies of their enemies, who are moving faster and growing more rapidly in numbers by the hour. Rohan, of course, is a rather important locale for the events of the "Rings" trilogy, and what helps add to the movie's muscle is not only the fact that the place was never even mentioned in "Fellowship," but the fact that it helps introduce us to several new and interesting characters as well. There is, for instance, Éowyn (Miranda Otto), a beautiful young woman with eyes for Aragorn and a yearning to do battle alongside the men of her country, and Grima Wormtongue (Brad Dourif), a sadistic messenger of Saruman's who manipulates his way into the Rohan kingdom and poisons the mind of its ruler, the wise and incessant King Théoden (Bernard Hill). The difficulty with any film follow-up is in establishing new personas successfully, but in "The Two Towers," the writers have not only matched the bright and solid characterizations of "Fellowship," but in ways have surpassed them. Éowyn's endurance and independence shine through even when the race of men demand that she hold her skills back, while Théoden brings the concept of high rulers down to a compassionate human level. Much of the movie revolves around war, and yet no so much that it undermines characterizations or perspective. Countless fantasy endeavors, especially those that utilize big battles, tend to overly emphasize the use of this kind of action until the sequences become too involved and difficult to clearly identify anyone, but thankfully, Peter Jackson has kept his wits about him when approaching this particular aspect of the screen treatment. The much-hyped battle between men and orcs at Helm's Deep, in fact, is one the most exhilarating war-oriented sequences I have ever seen, and not only is it the visual centerpiece for "The Two Towers," but perhaps for all of recent cinema as well. But is the movie better than "The Fellowship of the Ring?" Very close, but not quite. Admittedly, the first film's zest and enthusiasm is a tad more fulfilling than it is here, and the freshness factor elevated that zeal onto a platform of reasoning beyond just being pure excitement. But in no way is this a distraction or an insult to the final result here; in fact, I choose to think of it as an indirect compliment. Any way you look at it, this is the one effort that could have either held the interest or dwindled our expectations for the final chapter, so the fact that it pulls its own weight completely apart from its predecessor is quite a remarkable achievement. Moreover, the movie is beautiful, magnetic, breathtaking, exciting and imaginative on every scale. And at any rate, Middle-Earth and its inhabitants are starting to jump off the screen like they never have before.